Traditional Air Cargo trade patterns are supplemented by Sea–Air trade and by goods flowing from South Africa by air. The Middle East market accounts for 5.5 percent of African air cargo, estimated at 99,400 tonnes. The most important characteristic of this trade lane is its role as a distribution hub for goods traveling to and from Africa. Traveling to the Middle East are goods such as meat products, fruits and vegetables, and flowers. Products related to the oil industry dominate westbound traffic to Africa, supplemented by pharmaceuticals and machinery. Emerging oil and gas production in east Africa markets like Uganda will further expand this trade lane given its close proximity to the Middle East. Domestic African air cargo is not included in this analysis, but is estimated to total 174,000 tonnes. Domestic air cargo in Africa is strongest in some of the largest economies: Congo-Brazzaville, Democratic Republic of the Congo, Nigeria, South Africa, Angola, and Sudan. 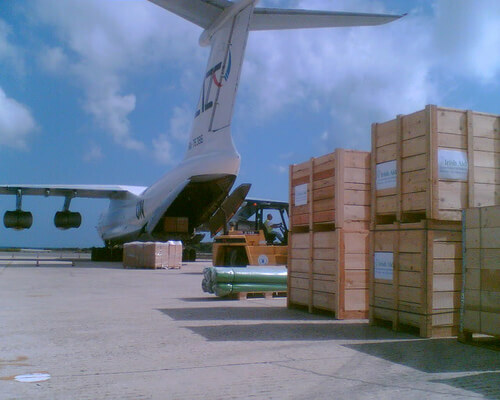 Air cargo often offers the most secure and reliable transit in these markets.